Cumnock is the second largest town in East Ayrshire and has many locally owned businesses, groups and organisations that help meet the needs of the wider community. It is important to ensure that Cumnock retains its status as a thriving town where its appearance and facilities are appealing to both residents and visitors alike. Cumnock is a friendly town that has a wealth of history and heritage whose residents are welcoming and care for their community. We are now constituted as a Scottish Charitable Incorporated Organisation (SCIO) Charity No SC047436 which means we are a legal charity within Scotland. 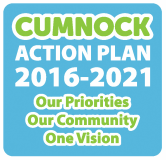 This will allow us to make application for funding for projects and initiatives to enhance Cumnock as part of the Cumnock Action Plan identified by residents and business people through the consultation in 2015. Continue to instill a sense of community spirit and pride in Cumnock. During the seven month period between August 2015 and February 2016 the steering group undertook an intensive community consultation. Production of a five-year action plan. Total returns 1,989 - making a 60.5% return rate. A further 415 people attended the two Open Day events in February 2016. This is a tremendous response and gives weight to the priorities identified within this plan. Cumnock Action Plan Steering Group was formed in July 2015 bringing together representatives from Create, Cumnock Area Musical Production Society, Cumnock Community Council, Cumnock History Group, Cumnock Juniors Enterprise Trust, yipworld, local businesses and local residents.